How are users managed in Password Safe? The following options are required to add local users. In general, new users are added in the same way as creating a local organisational unit. Therefore, only the differences will be covered below. Account is deactivated: The user is created with the status “deactivated”. The account is thus not useable. The write rights for a user can be set/removed with this option. In editing mode, the account can also be deactivated during ongoing operation. Restricted user: Controlling entities exist in many companies that are only tasked with checking the integrity and hierarchies of various pieces of information with one another but are not required to productively work with the information themselves. This could be a data protection officer or also an administrator in some cases. This would be the case if an administrator was responsible for issuing permissions to other people but should not be able to view the data themselves. The property restricted user is used to limit the visibility of the password field. It thus deals with purely administrative users or controlling entities. 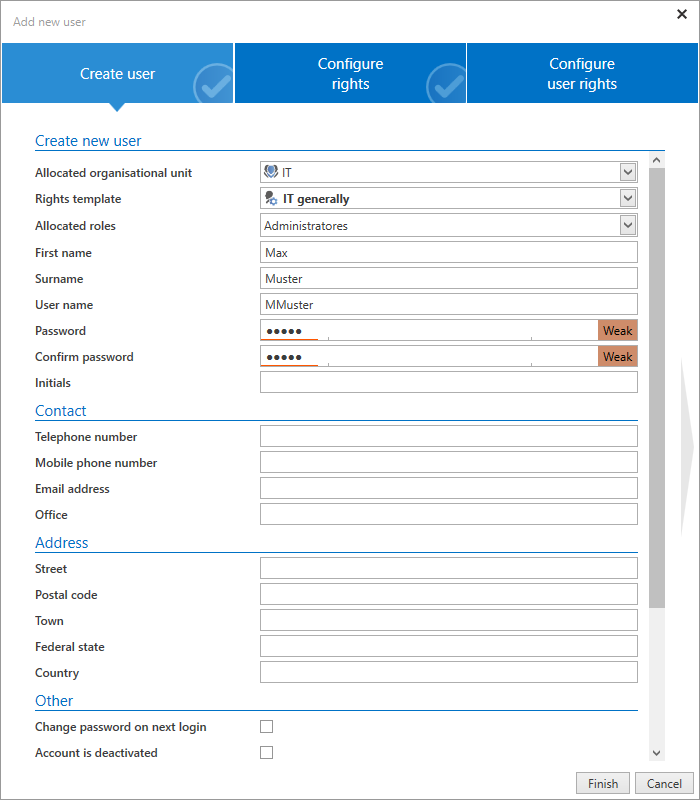 The second tab of the wizard allows you to define the permissions for the newly created user. If an allocated organisational unit or a rights template group was defined in the first tab, the new user will inherit its permissions. Here, these permissions can be adapted if desired. Users always receive their user rights via a role, which is either user-specific or global (see user rights). If no role is defined in the first tab “Create user”, the third tab will thus contain globally defined user rights. Importing from Active Directory can be carried out in two ways that are described in a separate section. There are two different types of licenses in Enterprise Plus, FullClient and LightClient licenses. In all other editions you can only purchase FullClient licenses. Please note that licensed LightClient users are not able to use the FullClient. However, FullClient Users can also switch to the LightClient. !For licensing reasons, it is not intended to switch from a FullClient user to a LightClient user! Our sales team will be happy to answer any questions you may have about licensing.